For almost all its history, China has been a predominantly rural society. While in Europe the number of people living in cities surpassed those in the countryside during the late 19th century, China only reached that mark in 2011. China’s urbanisation is set to continue at a swift pace. It's estimated that over the next decade and a half, 350 million people, more than the entire population of the United States, will become urban residents in China. Infrastructure is struggling to keep up, surrounding farmland is being encroached, and pollution is a major public health problem. One-fifth of China’s arable land is contaminated and three-quarters of the surface water flowing through urban areas is unsuitable for drinking or fishing. There have been many calls for a change to more human-centred development that emphasises social inclusiveness and environmental improvements alongside rational economic growth, rather than being dominated by it. Given China’s governance structure, a top-down approach to implementing smart-city technologies in this context might seem like a natural fit. But, like elsewhere, the most promising applications of smart-city concepts have started at the grassroots level. Urban agriculture is the practice of incorporating farming into city areas through mixed land use and innovative techniques that allow cultivation to occur on much smaller plots of land. In China, it’s become popular across the country as a means to promote urban sustainability and resilience by bringing food production closer to consumers and reducing its environmental footprint; encouraging awareness of food safety in response to major health incidences; and promoting environmental stewardship as urban air and water pollution proliferate in new cities. New technologies are assisting with the rise of urban agriculture. Sensors linked to automatic irrigation systems make growing on small plots easier, safer and more efficient. And farmer cooperatives have unprecedented opportunities to coordinate with one another to buy stock, specialise their production and market their products. As urban agriculture becomes more popular, it’s actively reshaping urban and peri-urban space, breaking up the monopoly of concrete and strengthening rural and urban links. Beijing is one of the early pioneers for integrating urban agriculture into its strategic development plans and acts as a pace-setter in many ways. Recognising the importance of urban agriculture to sustainable urban development in the late 1990s, Beijing’s municipal government launched an official programme encouraging multi-function urban agriculture in peri-urban areas by supporting the development of “agro-parks”, which not only produce food but also attract tourism and are used as educational tools. Beijing has created five zones that govern the type of agro-parks in the city. The “inner urban core” focuses on gardening, landscaping, and exhibition; the “inner suburban plain” specialises in recreational agriculture, which attracts tourism, and precision agriculture, which utilises smart technologies such as moisture monitoring for automatic irrigation; the “outer suburban plain” emphasises large-scale, modern agricultural production and processing; the “mountainous” zone is devoted to special fruits and ecologic protection; and finally the “regional cooperation” zone helps bolster food security by facilitating relationships with nearby cooperatives and helping to ensure the quality of imports. 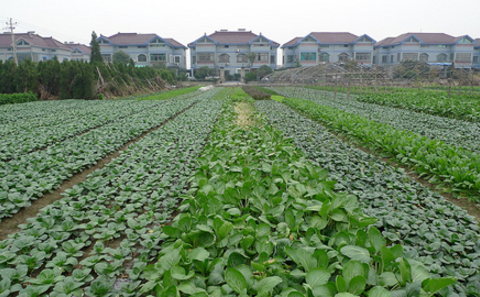 The long-term strategic development of urban agriculture took another step forward in 2004 when a programme dubbed the “221 Project” was launched by the city government. The project provides comprehensive guidelines and concrete actions for enhancing urban agriculture in each of the five zones. The first “2” refers to a better understanding of agriculture resources and urban market demands; the second refers to technology application and investment inputs; and the “1” calls for a single information system that links agricultural production, exchange, and marketing. Since its inception, the 221 information platform, managed and operated by the Beijing Rural Economic Research Center, has become a powerful network for supporting high-end urban agriculture. It serves as a dynamic knowledge base of best practices and an effective mechanism for quickly disseminating new policies. Citizens can get information about agro-related events and fairs, while farmer cooperatives and other organisations use the network to brand and market their products. Besides the 221 Project, Beijing has devoted considerable resources to applying new technologies to the urban agriculture sector in order to maximise efficiency and rationally utilise scarce water and land. To capture high seasonal rainfall variation, different types of rainfall harvest technologies are being piloted in the downtown area for watering parks and rooftop plantations. To combat air pollution, which has become such a problem in recent years, a new forest has been started on the outskirts of the city, with a planned area of over 6,000 hectares. Drip irrigation systems have been introduced for most greenhouses and large-scale farms within the city. In Shangzhuang, a small town west of the city centre, smart irrigation systems have enabled the return of a well-known rice brand traditionally grown by and for the imperial family. The city government has made several moves to help protect this relatively new sector. First, the government has begun assessing the financial value of urban agriculture. Based on a comprehensive and complex evaluation system with more than 30 variables, an annual report on urban agriculture’s ecological value was added to Beijing’s statistical year book in 2010. According to its measures, by 2012, urban agriculture – not just in terms of products but also its contributions to the social and environmental fabric of the city – was worth 340 billion yuan a year in Beijing with a growth rate of 6.1%. Second, the city government has started systemically evaluating the performance of its estimated 1,300 agro-parks and helping them improve through a more organised institutional framework. Urban farmers are encouraged to establish cooperatives to take advantage of their combined scale and bargaining power in buying farming materials and marketing their products. More importantly, through these cooperatives, the government is able to deliver subsidies to further incentivise growth, including selling organic fertilisers and less polluting pesticides at lower prices, both reducing farmers’ costs and enhancing food safety. These types of top-down reforms have helped foster what started as a bottom-up movement. For example, in the suburbs of the city, the Sijiqing town government established a consolidated committee to supervise the area’s 10 agro-parks and help organise farmer cooperatives in 2010. Since then, the agro-parks have improved their output through specialisation and increased tourism, generating benefits for multiple stakeholders and, most importantly, improving the local environment substantially.